Mangoes are celebrated in several ways in India. While the ripe mangoes are made into countless number of desserts and even some curries the raw mangoes keep tingling the taste buds with aam ka achar and relishes like kuchla, chhunda, aam ka khatta meetha achar and aam panna etc etc. 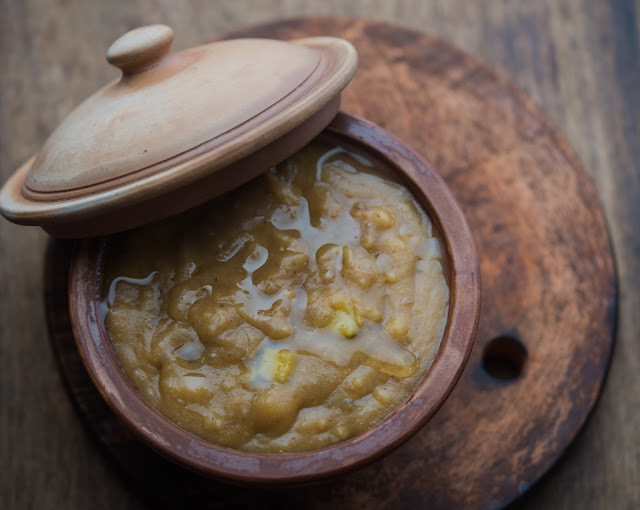 Apart from all these uses of raw mangoes, the most uncommon use is in a halwa like dish called as gudamma that my grandmother used to love so much that she would make a small batch almost every week during summers. The consistency is like lapsi or smooth oats porridge, I think technically gudamma is a raw mango lapsi and nothing else. Gudamma or gudamba is difficult to categorize into a dessert or something else, as I never saw it being served as a dessert. Gudamma was always a part of the thali, served along with the dal and subzi and one used to keep having it in between. It was one of the best palate cleansers if you ask me. I saw my grandmother (dadi) having it like a warm comforting snack sometimes. The most disturbing thing with gudamma is that I never saw it being made into other homes and always thought that it was something my grandmother had invented to satisfy her sweet cravings at a ripe age of 90, when her digestion was not so good and she couldn't eat much halwa, from the time I remember this dish. My dadi went on to live for another 12-15 years after that and gudamma was lost into the deeper folds of memory, till I discovered a gudamba recipe in the book Cooking Delights of The Maharajas by Digvijaya Singh of Sailana. Gudamba was made using semolina in the Sailana kitchen while my grandmother would make it with regular whole wheat flour, recipe simpler, not sure whether it was to make a short cut to the recipe which was unlikely knowing her zeal for cooking but I do remember my mother's disdain towards gudamma as she considered it to be worthless. My mother loved atte ka halwa loaded with ghee and loathed anything like lapsi. Lapsi was a term used to describe badly cooked food, devoid of all texture or taste. Dadi would always make lapsi alone in the kitchen, I remember peeking into the pan sometimes and getting a ladleful of gudamma to taste, it was not something the others would relish understandably. I didn't care much about the dish but the taste was never forgotten, possibly because dadi was so adorable always. I tried recreating gudamma a few times last year and even before that but somehow the taste was not the same as my dadi would make. Then I realised I was using much less sugar while my dadi was a sugar junkie, she used to keep Poppins (flavoured candies) in her pocket back then. Gudamma is an acquired taste for many, I like it in small doses at a time but can keep on getting second helpings. Gudamma grows on you. Heat ghee in a kadhai and tip in the mango pieces. Shallow fry briefly and add the flour. Lower the flame and roast the flour along with the mango pieces till the flour turns brown and aromatic. This needs a little patience so keep calm and stir continuously. Add sugar once the flour is aromatic and brown, mix and add water, stir vigorously to make a homogeneous lapsi or porridge. Add little more water if it gets thicker than porridge. Stir for a mnute and it is ready to serve. Pour in serving bowls and top with ghee. The subtly flavored sweet and tart gudamma or gudamba can be served with a topping of coconut cream or fresh cream too. I am sure you will find more ways to serve gudamba if you like it. This is very different ...didnt know about such recipe .Its difficult to imagine the taste ,maybe like aate ka halwa with mango flavour. 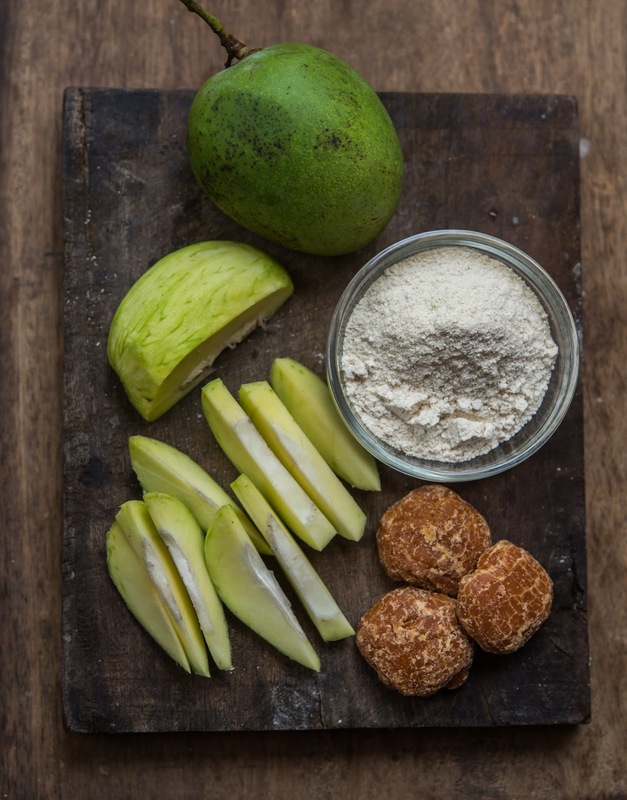 I will have to make it to taste it before the raw mangoes are gone .Well for me there is always something new to know in every post of this blog .Keep writing often . My guramha is different! The one tempered with Panch phoren and cooked along with salt and jaggery. We take it along with meals. Your grandma lived 100+? Or I got it wrong? Yes some people call the khatta meetha aam ka achar as gurhamma too. But this is a different recipe. Yes my dad lived for 107 years :-) and she was healthy, her death was a natural death. Awesome. Tried it at home today!!! Loving it! !